The arrival of cane toads (Bufo marinus) to our study site in the Northern Territory in 2005 has resulted in massive population declines of yellow-spotted goannas (Varanus panoptes), as they rapidly succumb when attempting to feed on these toxic amphibians. We have been monitoring yellow-spotted goanna population dynamics since 2001. 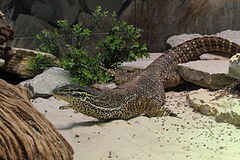 By focusing on immune gene profiles of goannas captured prior to and after the toad invasion we will investigate whether the dramatic decrease in goanna numbers has resulted in a concomitant decline in immune gene polymorphism and in increased susceptibility of the remaining goannas to pathogen infections. The project will support informed decision making on protecting the diminishing predators.